Never underestimate the value of words. Many of us remember the old story of the pastor who called the children to the front of the church for their weekly children’s time, whereupon he produced a tube of toothpaste. The pastor squeezed some toothpaste onto a piece of cardboard, and asked the children to figure out how to put the toothpaste back in the tube. They were, of course, unsuccessful, and the pastor thus reminded the children that our words are similar: once we say something, it’s out. We can’t take it back. So it’s important to choose our words carefully, to build up and not tear down with our words. We regularly regret hurtful words we say, but we can’t take them back; we can only apologize and hope to be reconciled with the person or people whom we hurt with our words. While attending my denomination’s general assembly these past few days, I heard a lot of words: motions, amendments to motions, amendments to amendments to motions, impassioned pleas, stories of joy and stories of woe. I also had occasion to chat with someone from a congregation in which I had done ministry a couple of times many years ago. As we spoke, she reminded me of some words I had shared with her – a loving challenge, really – which had been significant for her. I remembered that encounter, and she reiterated her appreciation for those words, and reminded me that the words I say can make a difference. Never underestimate the value of words. The words you say can make a difference. Choose your words wisely and well. God can and will use them. “Death and life are in the power of the tongue, and those who love it will eat its fruits” (Proverbs 18.21, ESV). Let’s all bear the fruit of love, and share the fruit of tongues whose power is used to edify others. 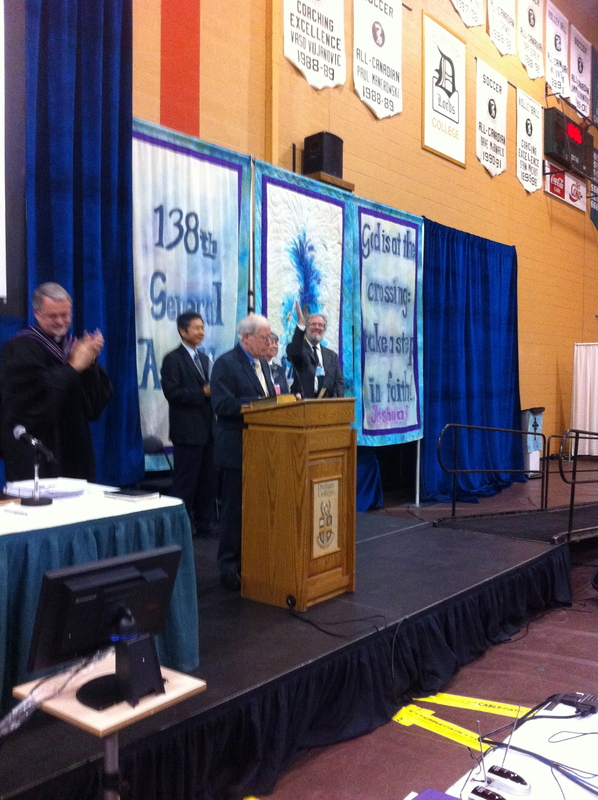 This week, I am a commissioner to the 138th General Assembly of The Presbyterian Church in Canada. Since each Presbytery sends one-sixth of its ministers, and an equal number of elders, to Assembly each year, it means that most pastors get to be commissioners several times over the course of their ministries. I’m not able to slack off, though, because I was appointed to the Assembly’s Committee on Business, which is sort of the embodiment of mad duck-paddling that takes place in order for the agenda of the Assembly to float smoothly down the proverbial river. Together, the committee members are trying to make the Assembly’s agenda run like a well-oiled machine, and we seem to be having a measure of success at it. The Assembly began on Sunday afternoon with “Q&A@GA”. Formerly, Assemblies hosted briefing groups for the whole of Monday in order to allow commissioners to be brought up to speed on the work of the committees and agencies of the church. This year, it was moved to a less formal ‘marketplace’ model and held as commissioners arrived on Sunday afternoon. Sunday evening saw the opening worship and installation of the Moderator. Worshipping with a thousand others is a great experience. The outgoing Moderator, Rick Horst, gave a fine message challenging the church to be more missional. He then installed the new Moderator, John Vissers, who has chaired each sederunt (sitting) of the Assembly since his installation. On Monday, numerous reports were heard and acted upon by the Assembly, and the Assembly banquet was held. The entertainment was a youth choir from the Durham region, and they sounded great. Catching up with old friends made it all a real blessing. On Tuesday morning, the Assembly took on a celebratory tone as retiring national staff and missionaries were feted. Along with that, we heard from a Presbyterian leader from Taiwan, who came to celebrate with us the completion and printing of the entire Bible in Hakka. Hakka is a dialect of Chinese, spoken by many people in Taiwan. It was an emotional occasion to see our own Paul McLean, a missionary and translator, talk about (and read from) the Hakka Bible. This just gives you a taste of what’s going on at General Assembly. Being able to spend free time with friends that I don’t get to see very often is a treasured bonus of coming to Assembly. We may not be in the ritziest town in Canada for Assembly, but it doesn’t really matter: most of our time is spent sitting in a gymnasium listening to stories of the work God has done, and praying and deciding about the work God may and will do among us. I love being part of a connectional church, where we are, indeed, not alone. When you see little bits in the bulletin each Sunday that connect us with the wider church, you’re getting a taste of our connectedness, and how it enables us to serve God and build his kingdom more effectively. Every day is a good day, as far as I’m concerned, but yesterday was an especially good day. Let me tell you why. I had two unexpected opportunities to spend time with people in my community, particularly in my neighbourhood. Both were what you might call serendipitous (happy accidents, one could say). The first occasion was at a local print shop. I had stumbled across a lovely photograph that had been taken by Andrea Kollo of our church’s tower, with the tree in front in bloom. It was a terrific picture, so I asked her if I could use it on the front cover of our Anniversary Sunday bulletin – to which she happily agreed. It is such a nice photo, I thought it would be nice to print the bulletin cover in colour. Having checked big-box store pricing, I thought I’d get a quotation from a local print shop. So I got in touch with Lucy at King Print and Design, who came in with a great price. I took the bulletin to the shop on a jump drive, and in the course of conversation, we realized that we are near-neighbours. What’s more, she is a friend of a delightful individual in our congregation, who speaks well of our church – so Lucy, too, has a positive view of our church. (She even printed the inside of the cover for me, as a favour. I was really impressed.) I look forward to more great conversations with her! The second occasion came as I was walking home from the church in the evening, having called a meeting at which, apparently, none of those invited were able to attend – so I had an unexpected evening free. On the way home, another near-neighbour, with whom I have had many chats, invited me up the driveway for a chat. He and his wife and I shot the breeze for a while, getting to know each other even more than we did before. Even though I would love to have had the meeting with the folks with whom it was set, I am convinced that God orchestrated it so that I could spend time with these neighbours! For pastors, it can be hard to engage with the community, because we are notoriously busy serving the people among whom God has called us to minister. So when those occasions arise to chat with folks who are currently outside the congregation, it’s great to be able to take the time with them. It builds bridges. The apostle John wrote, “Dear friends, let us love one another, for love comes from God. Everyone who loves has been born of God and knows God” (1 John 4.7, NIV). Make an effort to make friends with people in your community. God can use you to build bridges!